The Australian Curriculum is taught in government schools for reception to year 10 students. Disciplinary knowledge, skills and understanding are described in the eight learning areas of the Australian Curriculum: English, Mathematics, Science, Health and Physical Education, Humanities and Social Sciences, The Arts, Technologies and Languages. The latter four learning areas have been written to include multiple subjects, reflecting custom and practice in the discipline. In each learning area or subject, content descriptions specify what young people will learn, and achievement standards describe the depth of understanding and the sophistication of knowledge and skill expected of students at the end of each year level or band of years. The general capabilities play a significant role in the Australian Curriculum in equipping young Australians to live and work successfully in the twenty-first century. 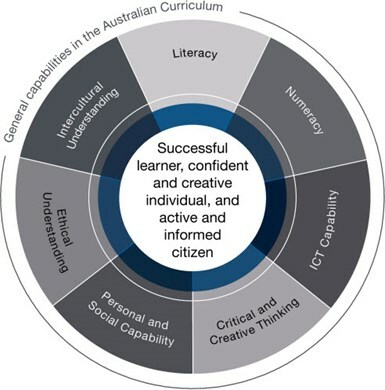 In the Australian Curriculum, capability encompasses knowledge, skills, behaviours and dispositions. Students develop capability when they apply knowledge and skills confidently, effectively and appropriately in complex and changing circumstances, in their learning at school and in their lives outside school.